SIM-Serv is active in the telecom sector since 1998. It was founded to avoid expensive mobile Data, SMS & Voice charges when travelling worldwide. It offers resellers and enterprises customized Cloud SIM Devices, inexpensive prepaid and postpaid SIM cards, VoIP services and corresponding administration portals. We offer easy, convenient and economical prepaid/postpaid Data, SMS & Voice solutions. By using our products & services consumers just pay a fixed amount to keep its global telecommunication cost under control. This allows any customer or connected device cost effective, global communication. Does not matter if e-mails are checked, messengers are used , video portals are accessed or Data, SMS & Voice is send via connected devices. Our SIM Cloud Devices, inexpensive prepaid/postpaid SIM cards and international call services provide major savings. Up to 80% of usual international roaming fees can be avoided. Our services can be used worldwide with any mobile/smartphone, tablet, PC, including traditional landline phones (only for call services). 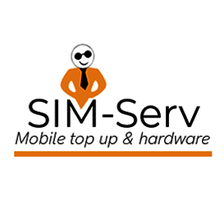 In summary, SIM-Serv provides cost effective and good quality, prepaid communication solutions for resellers and enterprises, serving frequent business, private travelers and people working or living abroad.